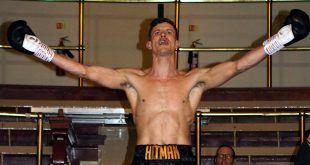 Last night at the Floral Hall in Southport, England, Steve Wood of VIP Promotions presented a fight night which would feature six thrilling contests. The venue is sited in a lovely location - right alongside Marine Lake in the coastal town of Southport - in the Northwest of England and was hosting its first boxing event since 1934. Even more surprising is that it was a warm, sunny day - with no rain! Boxing commenced with a four round light middleweight contest between Chris ‘Johno’ Johnson of Manchester and Geraint Harvey of Pontypridd, Wales. But it was a nightmare for the home-corner as Johnson is on the canvas in the first round. Looking stunned by the knockdown - Johnson digs in to see it out to the end of the round. The second frame sees the southpaw regain some composure as he throws lefts and rights at the head of the Welshman, but Harvey was motivated and had Johno down in the third frame again. Getting up for the count, the Mancunian looked dazed and referee Mark Lyson called a halt to the contest. Harvey wins by third round TKO and improves to 6 wins (2 by KO) and 43 losses (7 by KO). Quigley gave a good performance against veteran Nesbitt. 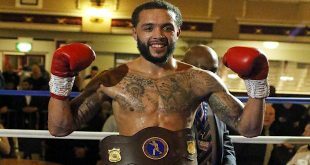 The Liverpool boxer landed some punishing body-shots in round one but gets caught by a right to the head in the opening seconds of the second frame. Nesbitt uses the same shot a couple of times during the contest with success. "Turn him! ", Quigley's corner urge their man on; "Body-shot, then roll!" shouts brother Tony from ringside. Nesbitt is bundled over during round four, then loses his gumshield which gives him a ’breather’ from Quigley's body-shots. Quigley wins on points, 40-37, and improves to 3 wins and no losses. Tony Quigley seemed happy with his brother's performance. "Dynamite" Dilks notched up another solid performance, this time against Polish-born Banbula. Getting off to a good start, Dilks really settles in to the fight by the second frame using some nice combinations. Round three sees the Liverpool man land some big body-shots and as Banbula goes in with the right - Dilks spears upwards with a screw-style uppercut. Round five sees Dilks sustain a cut to the left eyebrow and as they face each other in the sixth and final round, both men are told to keep it clean by referee Steve Gray. There’s a bit of goading in this final frame and both men land big punches but it’s been a more mature performance from Dilksy who gets the points win 59-57. His record now stands at 12 wins (4 by KO) and 1 loss. Jennings enjoyed a great performance against Albanian-born Riyaz. He used a whole variety of shots in round one including some lovely uppercuts and shots to the body. Round two sees Jennings land with some impressive screw-shots. He looked in great form and secured the points win, 39-37, to improve to 4 wins (1 by KO) and 1 loss. 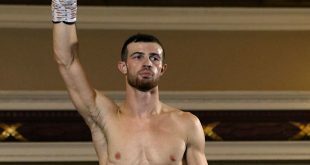 Godding got off to a shaky start when Askew flew out of his corner and within seconds of the first round the Bolton man found himself being counted. I’m not sure as to what happened here because the incident occurred in the neutral corner out of my view, but Godding had remained upright. He took the count and Askew kept busy for the remainder of the round. 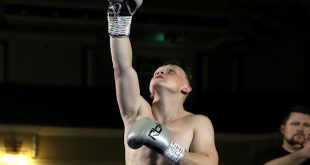 Askew sustained a cut early in round two which seemed to bother him and after that, the fight became a bit of a scrap!. Askew eases off in round three and Godding has a good round four to secure the points win 59-56. Godding's record now stands at 9 wins (1 by KO) and no losses. 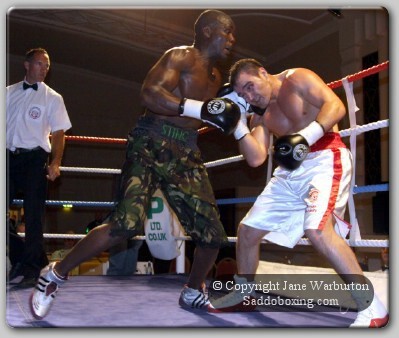 Top of the bill was Southport's own Mike Stafford in a four round cruiserweight contest. 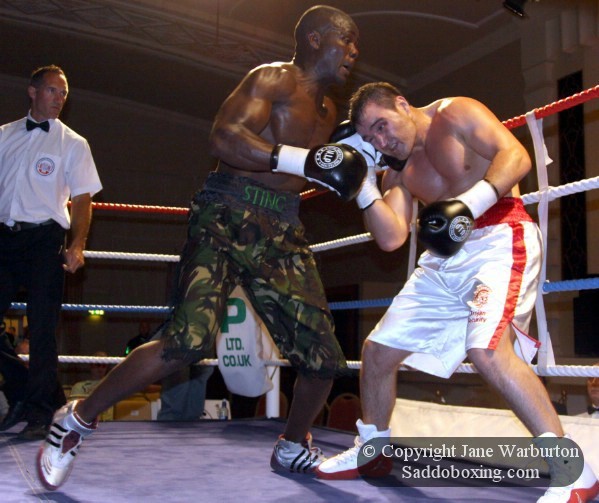 Stafford - who hasn’t fought for 12 months - was clearly pleased to be fighting in his home-town of Southport, but it wouldn’t be an easy contest against experienced Hastings Rasani of Birmingham. Under pressure in round two, Stafford sustained a nick in the corner of his left eye. Past the mid-way point in the round, Stafford suddenly stops boxing and walks away from his opponent - realising he hasn’t got his gumshield in! Despite being under pressure at the end of the round from a determined Rasani, Stafford sees it out to the bell. In fact, Rasani had a good contest, causing all sorts of problems for the home boy. But Stafford gets the points win, 39-38, and improves to 6 wins (1 by KO) and no losses.